KosherVeg Market > The Compassionate Report > Action Alerts > Why Is Jay Jays on PETA’s Fashion No-No List? Just Group – which owns Dotti, Portmans, Jay Jays, Just Jeans and more – told PETA that it will not pledge against the use of angora wool in its clothing lines, despite having been made aware of the barbaric treatment of angora rabbits. Let’s send the message to Just Group that the coolest trends in fashion don’t involve harming animals. China – where there are no penalties for the abuse of farmed rabbits – produces 90 per cent of the world’s angora fur. A PETA Asia investigation of rabbit farms in China documented rabbits screaming in pain as workers ripped their fur out of their skin – something that occurs every three months. When rabbits who are sheared desperately try to get free, they are often cut or otherwise injured and can even suffer from heart attacks. After this terrifying ordeal, angora rabbits lie motionless from shock and fear inside cramped, filthy cages. The intense confinement can cause these highly social animals to go slowly insane. One farmer told PETA Asia’s investigator that 60 per cent of the rabbits die after only one to two years. Just Group refuses to join dozens of other Australian retailers and designers, including Aurelio Costarella, David Jones, Myer, George Wu, Carly Hunter, Paolo Sebastian, Alexi Freeman and Natasha Gan, which have pledged not to use wool from angora rabbits in their designs. Refusing to spare animals from that kind of bloodcurdling suffering is beyond a fashion no-no. 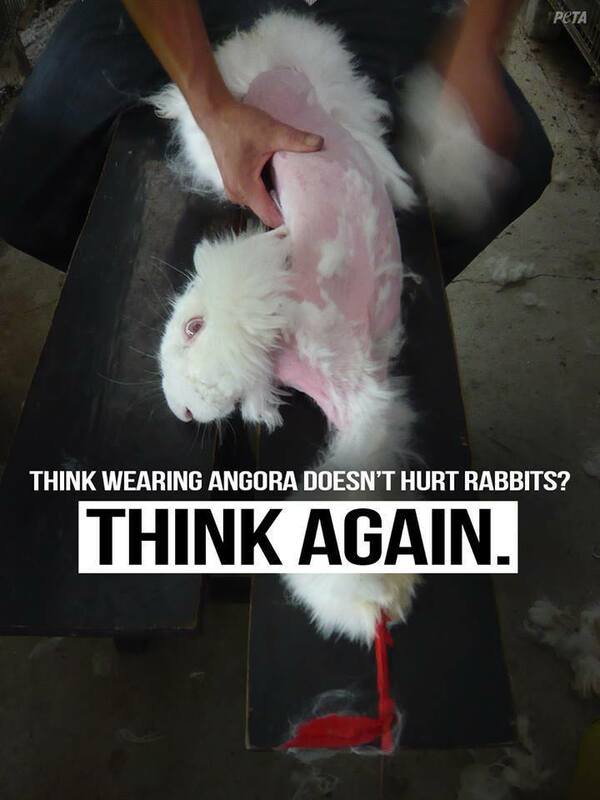 Do your part and tell Just Group to stop supporting the abuse of angora rabbits.